N appearance this bird resembles a large Tern (See The Black Tern), and its habits are similar to those of the Terns. Inter-tropical, it is of a wandering disposition, breeding on the islands of mid-ocean thousands of miles apart. It is noted for its elegant, airy, and long-protracted flight. Davie says that on Bourbon, Mauritius and other islands east and south of Madagascar it breeds in the crevices of the rocks of inaccessible cliffs, and in hollow trees. In the Bermuda Islands it nests about the first of May in holes in high rocky places along the shores. Here its favorite resorts are the small islands of Great Sound, Castle Harbor, and Harrington Sound. The Phaeton, as it is felicitously called, nests in the Bahamas in holes in the perpendicular faces of cliffs and on the flat surfaces of rocks. A single egg is laid, which has a ground-color of purplish brownish white, covered in some specimens almost over the entire surface with fine reddish chocolate-colored spots. These species compose the small but distinct family of tropic birds and are found throughout the tropical and sub-tropical regions of the world. Long journeys are made by them across the open sea, their flight when emigrating being strong, rapid, and direct, and immense distances are covered by them as they course undismayed by wind or storm. In feeding, Chapman says, they course over the water, beating back and forth at a height of about forty feet, and their long willowy tail-feathers add greatly to the grace and beauty of their appearance when on the wing. They are of rare and probably accidental occurrence on our coasts. The people who make a study of birds say that I look like a large Tern, and that my habits are like his. I don’t know whether that is so, I am sure, for I have no acquaintance with that bird, but you little folks can turn to your The Black Tern and see for yourselves if it is true. For my part, I think I am the prettier of the two on account of my long, willowy tail-feathers. They add greatly, it is said, to the grace and beauty of my appearance when on the wing. Then, the color of my coat is much more beautiful than his, I think, don’t you think so, too? We are not so common as the Terns, either, for they are very numerous. There are only three species of our family, so we consider ourselves quite distinct. What are we noted for? Well, principally for our long distance flights across the sea, elegant and airy, as the writers say of us. Maybe that is the reason they call us the Phaeton sometimes. Do we go north in the summer as so many other birds do? Ugh! You make me shudder. No, indeed! We never go farther north than Florida. Our home, or where we build our nests, is in the tropical and sub-tropical regions, where the weather is very warm, you know. We are great wanderers and build our nests on islands, way out in the ocean many thousands of miles apart. Oh, no, but in any hole we see in the face of a great rock or cliff, and sometimes right on the top of a rock. Only one. That is the reason, you see, that our family remains small. Oh, my, no! We are not singing birds. We have a call-note, though harsh and guttural, which sounds like tip, tip, tip. Nest—In holes in the perpendicular faces of cliffs, also on the flat surfaces of rocks. 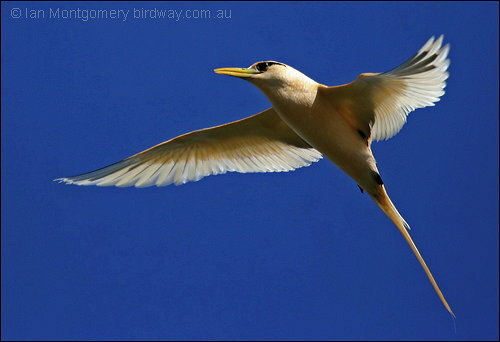 Our Yellow-billed Tropic Bird is now the White-tailed Tropicbird (Phaethon lepturus). It’s name has gone through several changes according to Avibase. What a lovely bird the Lord created with this family of birds. They are members of the Phaethontidae – Tropicbird Family which only has three species; the Yellow-billed, Red-tailed and Red-billed. The White-tailed Tropicbird Phaethon lepturus, is a tropicbird, smallest of three closely related seabirds of the tropical oceans and smallest member of the order Phaethontiformes. It occurs in the tropical Atlantic, western Pacific and Indian Oceans. 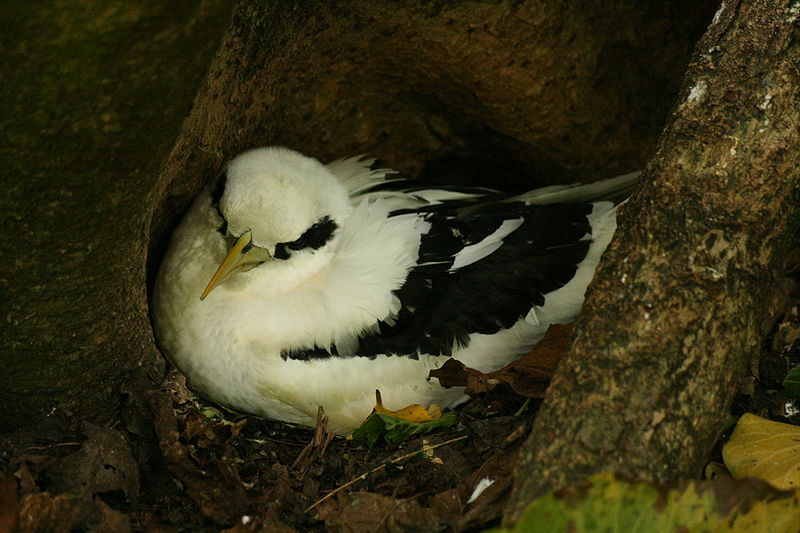 It also breeds on some Caribbean islands, and a few pairs have started nesting recently on Little Tobago, joining the Red-billed Tropicbird colony. In addition to the tropical Atlantic, it nests as far north as Bermuda, where it is locally called a “Longtail”. The White-tailed Tropicbird breeds on tropical islands laying a single egg directly onto the ground or a cliff ledge. It disperses widely across the oceans when not breeding, and sometimes wanders far. It feeds on fish and squid, caught by surface plunging, but this species is a poor swimmer. The call is a high screamed keee-keee-krrrt-krrt-krrt. The adult White-tailed Tropicbird is a slender, mainly white bird, 71–80 cm long including the very long central tail feathers, which double its total length. The wingspan is 89–96 cm, and there is a black band on the inner wing There is black through the eye and the bill is orange-yellow to orange red. The bill colour, pure white back and black wing bar distinguish this species from Red-billed. 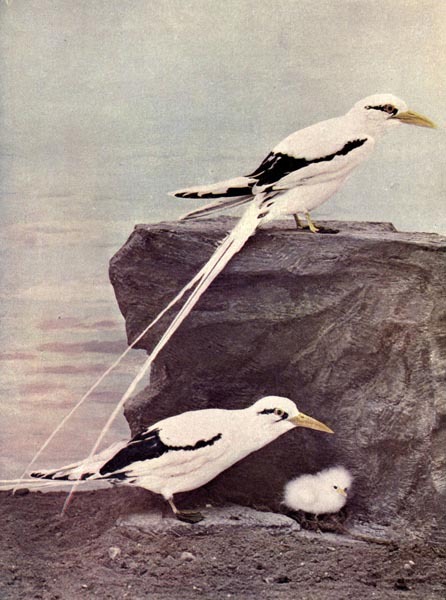 This entry was posted in Birds, Birdwatching, Christian, From The Past and tagged Birds Illustrated by Color Photography, Home School, Kids, Nature, Photography, Vol 2 #5 Nov 1897, White-tailed Tropicbird, Yellow-billed Tropic Bird, Youth. Bookmark the permalink.